January 20, 2013 Al Qabas Newspaper published the below Ad for "The Best Photo of Kuwait in 2012"
Al Qabas Newspaper in coordination with the Ministry of Information (Media) is holding a competition for the best snapshot taken in 2012 of different aspects of life in Kuwait. The purpose of this competition is to encourage the talented youth to practice their hobby and motivate them to continue mastering their talent, through publishing their works. The supervisor of this competitive Mr. Hussain Abdulrahman said: "The committee will be having three judges who will be responsible for evaluating the photos, Dr. Ahmed Dashti - from Kuwait University, Mr. Abdullatif Buknan - Director of Photography Division in Ministry of Information (Media) and Mr. Khalil Albourini - Head of Photography Department in Al Qabas Newspaper." 1. Photo should have been taken in 2012. 2. Each participant is eligible to submit three different photos. 3. The photo should be original and NOT edited by Photoshop or any other software. 4. Photo to be submitted on a flash drive (USB) and printed on an A4 white paper. 5. The participant must write his/her name and mobile number on the flash drive (USB). 6. 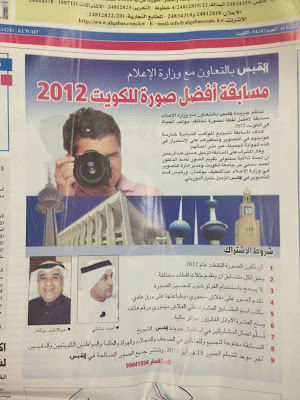 This competition is open to all, staff of this newspaper, magazines staff, students, Kuwait citizens and residents. 7. Top 10 winners will get cash prices. 8. Participants must submit their works in Al Qabas reception area - Al Shuwaikh. 9. Last date of submitting the photos will be February 15, 2013. Winner's photos will be published in Al Qabas Newspaper. For more details contact mobile number 99041556. Al Qabas Newspaper is pleased to announce that they are planning to extend the photography competition till February, 2013. Meaning this competition will be about the year 2012, January and February 2013. They want to include January and February of the current year as of what Kuwait have witnessed different weather conditions. The last date of submitting the photos will be March 15, 2013. Shop and Ship Extra - A new Amazon website !